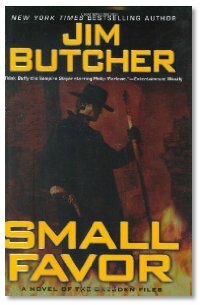 Interview: Just about every show member who's local to Phoenix dropped by for this one, because Jim Butcher came into town for a book signing. A very well-attended book signing at The Poisoned Pen in Scottsdale, since he was delayed there an extra hour signing books for folks. Mike M, Summer, Mike S and Brian chat with Jim about the tests and trials poor Harry Dresden's been put through, and possible expectations of future adventures in the wringer for Harry. Definitely check out the new Dresden Files comic series, now available from the Dabel Brothers. The first comic series is a prequel to Storm Front, followed by a 14-18 issue adaptation of Storm Front, followed perhaps by more prequels and adaptations. he was way cool and funny to meet. he talked for a while and laughed about my world of warcraft stuff. hehe. I liked dersin on tv and going start reading his books soon, think i will start with the fantasy ones. dad is reading the new dresin one now and really likes it.